Today I have two reviews for two very different books I've recently read. Both were good. I had some commentary about literary vs. commercial and the ultimate power of entertainment and depth and how a reader doesn't have to like either/or floating around in my head, but it's Sunday and sunny outside and that lets me off the hook. =D Instead, I'll just give you my reviews. 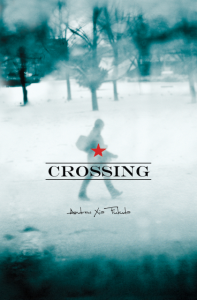 CROSSING by Andrew Fukuda: CROSSING was a semi-finalist in the Amazon Break-Out Novel contest and will be released April 27th by AmazonEncore. Preview copy was sent by publisher. Xing (aka Kris) is a loner, a Chinese American in a school devoid of multiculturalism. He struggles with his identity, bullying, girls and a string of murders putting his small town on edge. Fukuda tackles heavy themes of racial profiling and isolation through Xing's sometimes angry, sometimes funny, always insightful voice. And yet, is Xing a "reliable" narrator? Can we count on him to tell the "real" truth, to give us all the clues to his person -- and the mystery -- as we read? It's both fascinating and eye-opening to discover the town through Xing's outsider eyes, most notably the quick way others dismiss Xing's talents (especially his own best friend) and the treacherous way they point their fingers accusingly at Xing in the belief he could be a killer. His observations reveal wrongs that others are quick to dismiss. Fukuda's writing is dense and rich, with layers of meaning and characters to discover. You might want to read it slowly to capture all the depth of the writing. I was disappointed with the revelation of the murderer. I felt there were so many more interesting possible murderers in the characters Fukada really developed that the true killer -- brought in at the last minute with a Buffalo Bill (Silence of the Lambs) flavor -- was a letdown. A good read nonetheless. THE NAUGHTY LIST by Suzanne Young: This book came out back in February, but I only just got a copy and read it. I liked it so much, I wanted to share it! The premise itself is super: Tessa Crimson’s the sweet and spunky leader of the SOS (Society of Smitten Kittens), a cheer squad–turned–spy society dedicated to bringing dastardly boyfriends to justice, one cheater at a time. Boyfriend-busting wouldn’t be so bad . . . except that so far, every suspect on the Naughty List has been proven 100% guilty! When Tessa’s own boyfriend shows up on the List, she turns her sleuthing skills on him. Is Aiden just as naughty as all the rest, or will Tessa’s sneaky ways end in catastrophe? But even better is Suzanne's fun, fresh and fantastic writing. I adore Tessa's brand of swearing. Each character in the novel pops from the page. It's an easy read, one that I finished in a single sitting, perfect for lounging in the sun or getting perked up after a long day. The Naughty List sounds really good! The Naughty List is definitely on my TBR list! And THE NAUGHTY LIST seems supercute. I heard abotu Fukuda's novel before it was released, but lost track of it. I so need to write a TBR list. I've been meanin to pick up the Nuaghty List for a while now too.